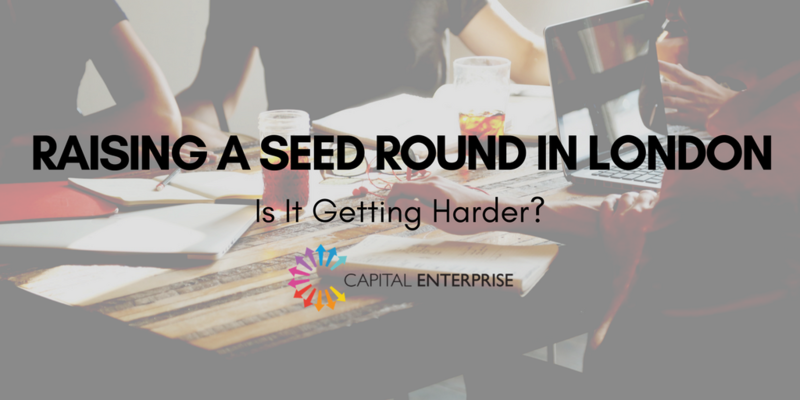 Raising a Seed Round in London: Is It Getting Harder? The Beauhurst Report on investment for 2017 shows that the number of investments in UK tech startups is likely to dip below 1,000. The pre-seed and seed stage crunch is seemingly a world-wide phenomenon, but the impact was particularly felt in London. If there is a good case for seed stage investing, why is it in decline? Could it be that there are fewer good, investable startups around than before? Are the latter stage investors right - is tech now a game for scale-ups? I strongly believe that this is not the case. I contend that great startups are created every day, that there are markets still ripe for disruption, and that new underlying technologies are more likely to give big advantages to new players rather than to existing incumbents. We at Capital Enterprise must saw over 800 startup pitches in 2017, and see that for a startup to get investment they have to be more ambitious, braver, be better informed, technically more able and much more focused on what it takes to prove "product-market fit" than ever before. What worked in 2014 will not work now, and new insights and new pitches are required. A: Tech-Enabled Business Model Innovation Plays. There are very few verticals where you can say you can beat the existing incumbents’ offers by being "Mobile First", or the first to employ "Cloud based Distribution" or “data driven decision making tools", or even the first to "digitalize". Yet in 2017 we kept seeing entrepreneurs with impressive domain expertise and industry connections, telling me that in their sector it is true that a relatively proven technology can, properly deployed, be truly disruptive. A good example of a startup disrupting a late to tech sector is Stowga - the warehousing on demand platform who last year raised a £1.5m seed round. B: Execution Plays. One where the existing and future players in the market, particularly those using technology to drive business model innovation, have been studied in depth, where a play-book has been devised by the new startup based on adopting from the best and learning from the mistakes of the early entrants, and where in the opinion of the often expensively assembled team of "superstars" the market has yet to decide who will be the "winner". An example of a new startup focused on building a better product in a highly competitive market is Easle. As would be expected from this ex-Dojo team, the product is both beautiful and easy to use, and that’s why they were able to raise a seed round in 2017. C: Innovation Plays. As a 2017 startup, how do you out-innovate incumbents that have much more money, talent, and data at their disposal than you, as well as trusted brands and locked-in mostly pliable customers? Start by choosing an innovation were the breakthroughs are extremely recent (thereby turning all the tech know-how advantages of existing players into technical debt), and where having the ability to attract the top, extremely scarce, technical talent trumps everything else. Add in an ability to generate new value enhancing capabilities to your early adopting clients and a universal fear by all incumbents of being left behind, and what we have is the reason why AI/ Machine Learning is the main source of innovative advantage for startups, at least in London (even though Blockchain/Utility Token startups and in 2018 AR & VR are also interesting). London went big on AI in 2017, and great startups such as Fluidly, Bud, Count Open, V-Chain, Flux, Count Open and Fact Mata raised good seed size rounds. So, my advice for startups raising a seed round in 2018 is that times are good for those who are brave, smart, and focused. With this, a seed round can be raised. Meet Capital Enterprise and business service providers, as well as a broad spectrum of funders and entrepreneurs, at the flagship Business Funding Show 2018, an all-day event on 22nd February at London’s East Wintergarden. Learn more and secure your ticket at bfsexpo.com.